Did you catch the Home Alone marathon on FX? We did. We’re at Grandma’s and Grandpa’s house for Thanksgiving. The five of us, Mom’s grandparents, Mom’s cousin and her friend plus both of mom’s sisters, their 5 kids and my brother-in-law are all here. Nineteen for Thanksgiving dinner. Relatively small for a holiday gathering at Grandma’s house. As Mom’s cousin and her friend are leaving, Grandma forces some Thanksgiving leftovers upon them. Holiday tradition right? Except they are carrying bags of hamballs. Personally I’m not a big fan of the hamballs. Don’t really like to eat things that end in “balls.” But that didn’t stop me from pointing out what they were carrying out. Grandma didn’t find it nearly as funny as I did. Yesterday I was left at the house with Bails, Kinz and two of my 4 nieces – ages 4 and 7. Left them in front of the TV watching Parent Trap for awhile. The 1961 original not the ’98 remake with Lindsay Lohan. Don’t want them picking any bad habits. That went well until they decided to have a shooting war with stuffed animals. They armed themselves with shields and then started hurling the stuffed animals at each other. We transitioned to a few games of hide and seek. While they consider hiding fun, it is not something at which they excel. The object of hiding, as I understand it, is to not be found. The girls, it became apparent, believe the object of hiding is to not only be found but to give hints as to where they are hiding. Mostly bird sounds. Some giggles. Then they wanted prizes for being the last one found. Among the suggestions: M&M’s, donuts and pop. Sensing a surge of energy, I suggested the girls go outside for awhile. Lucky for me there are only two swings and they got to fight over them. Also lucky for me Spike has Band of Brothers on all day. We’re probably going to attend more Cyclone basketball games. The girls had fun and more importantly, they were really pretty damn good. 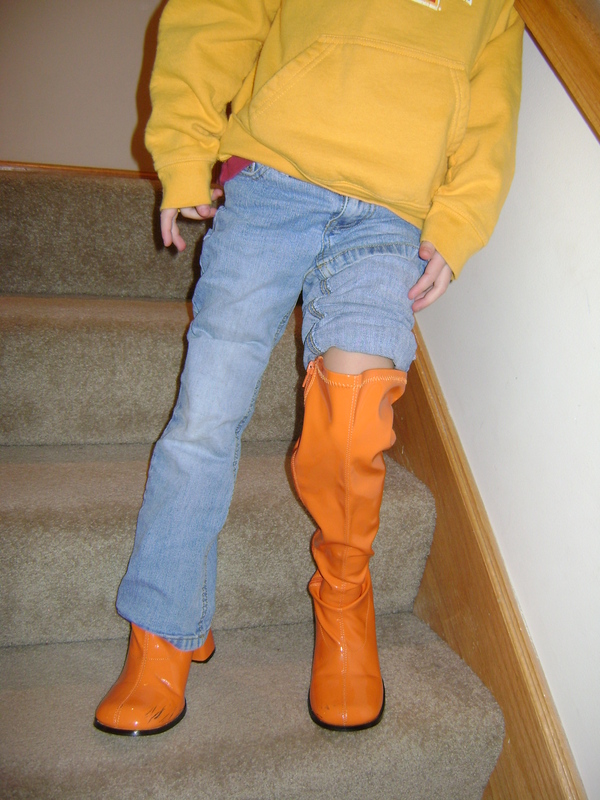 Aside from Bails trying to get out the door wearing these. 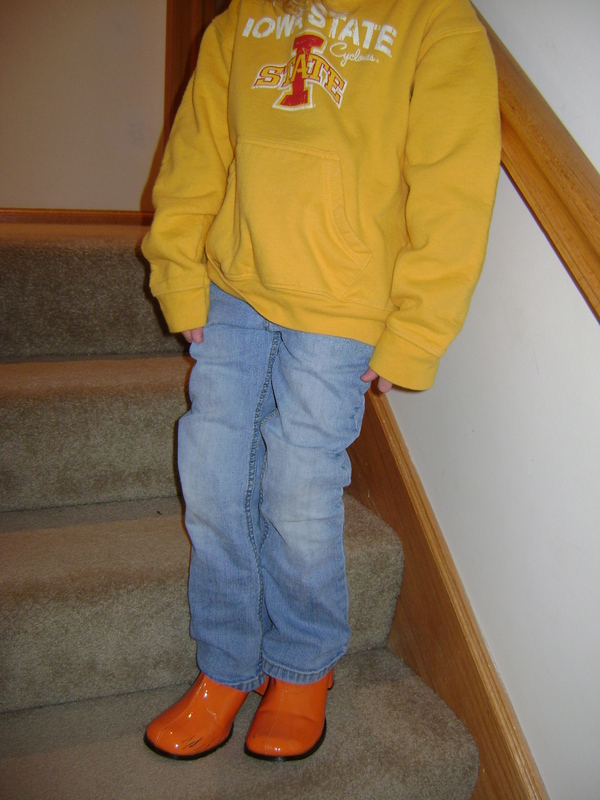 Orange shoes? C’mon Dad, what’s the big deal? This. This is the big deal. And if you discount the fact getting her to sit relatively still was about as successful as trying to contain a greased octopus. But all of that happened with about 5 mintues left. Anyway, I don’t think any of the girls had more fun than Kinsey. Maybe Bailey and Riley when Kinz and I brought them cardinal and gold snow cones. No ice cream because the line looked like a bunch of Canadians waiting for health care. Plus we were six rows off the floor behind one of the baskets. Great seats. Mom and the girls even got on the big video board a few times. More basketball games for us. Kinsey had a tough morning today. Which is too bad because nobody was more excited about this week as her. Maybe me. But its close. Its Thanksgiving Week. You get two Fridays and a holiday that revolves around football. That’s not a bad week. Plus it’s officially Christmas season starting Friday. The girls only have school Monday and Tuesday. To take advantage of that, we’re taking them all to their first Cyclone basketball game this evening. If they’re good, they can have a Cyclone swirl cone. Which is cardinal and gold colored soft serve ice cream. I’m bringing lots of wipes. Anyway, I’m brushing away and Kinz says, “Dad this is going to be the best week ever. We only have to go to school for two days, we going to our first Cyclone basketball game and get ice cream and we get to go to Grandpa and Grandma’s house.” Except she said it without taking a breath or any of the normal pauses you would anticipate. Anyway, ever since Kinz was about three she’s had this aversion to wearing shirts that have “things” on them. It’s weird. For example, if a shirt has any lettering or design that is located within an area that Kinsey believes is the center of the shirt, she won’t wear it. But if the entire shirt has a pattern like stripes or polka dots or a design that isn’t located in the center but off to the side or located on both the left and right lapel areas, she’ll wear it. She’s corporate America’s worst nightmare. Solid color shirt? No problem. Nike logo in the middle of the shirt? No can do amigo. It’s taken time but we’re pretty clear on what she’ll wear and what she won’t. The amount of resistance likely to occur and the amount of time before I need to be at work are key determinants in picking out her clothes for the day. Today, however, Mom decided to prove a point. Proving a point for no other reason other than we’re the parents and they are the kids is a perfectly acceptable thing for parents to do. It’s a proven technique. Parents, coaches and dictators have been doing for years. Why did Ditka put in the Fridge in Super Bowl 20 to score a touchdown when it was already 37-3? Because he was proving a point. Why did the Germans take the Sudetenland in 1938? Because they could. Mom and I have employed this technique separately and jointly over the years. I, however, have chosen not to employ this strategy in the morning. Its not a battle I’m willing to fight before 7 a.m. on a weekday. Any other time, except for the obvious exceptions involving the period of time right before a Steelers game, I’m willing to utilize blitzkrieg and/or shock and awe techniques to end any disagreements. Mom, on the other hand, has no such aversion to fighting this battle at any point during the day. Today she decided that Kinz was going to wear this shirt. It’s nice. 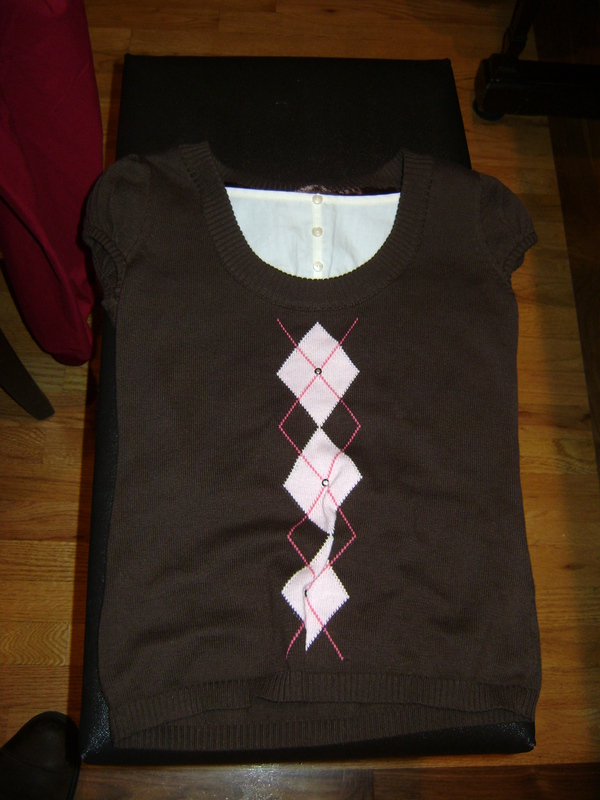 But, as you can plainly see, it has an argyle pattern that goes right down the middle. Now this really isn’t a cut and dried case. It’s possible that the three diamonds in the argyle design constitute enough of a consistent pattern that covers enough of the shirt that Kinz will deem it wearable without crying. And screaming. And whining. It is also possible that it is included in the “shirts with stuff on them” group that Kinz isn’t going to wear. And she has decided this firmly. Its like she’s decided its just part of who she is. Like irrelevance to Chris Matthews. But Mom is like Grant at Vicksburg and resistance eventually collapses save a few muted whines. Did you see that? She seamlessly, almost effortlessly, went from the whining and crying routine right into the sweetness and charm method. Flash drives are pretty handy. They’re portable. They can hold lots of important stuff. You can also use them without any discernable skills or training. Like Nancy Pelosi and a gavel. I have a flash drive. I keep it right next to my computer at home. I take it back and forth to work a lot. It is in and out of my pockets more than Geithner and the boys over at Treasury. Problem is they small. And are easily misplaced if your are not careful. Like children at Target. When I get home from work I almost instinctively take it out of my pocket and place next to the computer. There have been a few times I’ve left it on my night stand. I did this a few days ago. It was also the last time I saw the flash drive in question until last night. Several things cross my mind. 1) “Dammit!” 2) I’m going to need to design a grid by grid search, bring in some portable spotlights, some bloodhounds and a metal detector. 3) I have three kids. I ask Riley if she’s seen it. That makes sense. That’s the last place I remember seeing it too. I search the night stand and the area surrounding it. No flash drive. But I do find 37 cents and the 2004 Big 12 Football Preview from Athlons. Idiots. They picked the Cyclones to finish last in the North. We tied for first. Beat Nebraska and scored three touchdowns in two minutes to beat Kansas State. They had Darren Sproles that year too. A thorough search of the desk and floor around the computer reveals nothing except that I really need to clean off the desk and floor around the computer. She smiles, gets up from the dinner table and leads the way up the stairs into our bedroom. She flips up the bedspread and there it is…plugged into the bed right between the mattress and boxspring. I’m pretty sure I wouldn’t have looked there. I like parent-teacher conferences. Although we did have to miss the third installment of the remake of “V” last night. In the first episode, you could substitute the rhetoric of the Obama campaign last fall for the dialog from the V’s and it was pretty much like watching the same thing. Anyhow, back to the conferences. I like them now and I think I liked them when I was a kid too. Or at least I didn’t mind them. Probably because they resulted in two half days on a Thursday and Friday during the first week in November every year. 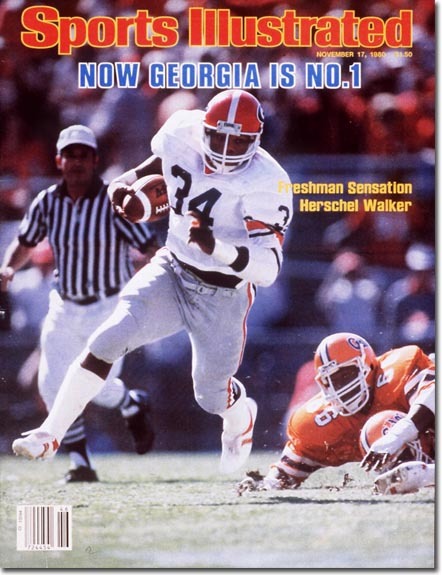 An extra half day to pretend you’re Herschel Walker was an excellent way to spend a Friday afternoon back in 1980. I like visiting the girl’s school. Back in grade school my teachers always decorated the classrooms with the appropriate holiday or seasonal décor. Don’t really see that in the office when you’re a grown-up. Nobody really tacks up pictures of turkeys or pilgrims in their cubes. Yesterday we had all three conferences for the girls. Plus we had to fit in a conference with the music teacher to talk about much Rye is rockin’ the violin. Teacher says she’s doing well. Although I really have no frame of reference for this. Best I have is that I can doing fairly well playing “Hungry Like the Wolf” on Rockband. Not to mention my air guitar prowess on classics like Def Leppard’s Photograph and Van Halen’s Panama. Needless to say, Bails spent some time in the hall thinking about that as all the other kids went outside for recess. Eventually she slinked back into the room to talk it over with her teacher. But that was only because the rest of kids started coming back inside and she knew that if her sisters saw her in the hallway they’d tell us. So a good start to the conferences and a wonderful injection of confidence into our parenting egos. Kinsey’s conference is next. In her class and in Bailey’s class they had to write down what they were thankful for on these little turkeys. For example, if it were me I’d write “Ben Roethlisberger” on my turkey. Or maybe “Nachos.” Anyway, after they wrote it down, the class pinned them onto a bulletin board. Kinsey was so thankful she needed three turkeys. She was thankful for her family, for Jesus and for God. Excellent. After getting sacked in the Bailey’s room, this was like Donovan McNabb hitting Freddie Mitchell on 4th and 26 against the Packers in the 2003 playoffs. What was Bailey thankful for? Not her family. Not Mom and Dad. Not even her favorite blanket. Lunch. Practicality is evidently one of her strengths. Aside from being a bit chatty, which leads to falling a bit behind on getting her work completed, Kinsey is doing great. She loves her teacher. And with her teacher being a Steelers fan, its easy to understand the fondness. You’d think that a conference like this would have us leaving the room like Patton after El Guettar. Bailey, however, decided that Kinsey’s conference was just an opportunity for her to demonstrate the level to which she’s developed her aptitude for disruptiveness. And you know, unless you’re a defensive coordinator, disruptiveness is not a positive skill set. First she sat on my lap and incessantly asked if I knew how to spell random words that popped into her head. This became annoying. Not painfully annoying but more like Katie Couric pretending to be an objective journalist annoying. I made a move to stand up, grab her and take her into the hallway. But I was too slow. Sometimes I think Mom has small retractable poison tipped darts in her fingernails. Either that or she’s really Jet Li. She reached out, grabbed Bails on the shoulder and guided her onto the floor next to Mom’s seat. She looked like Spock using the Vulcan nerve pinch. Finally we made it to Riley’s conference. Riley’s conferences have always gone well. All parents need a kid like Riley simply to buoy your belief in yourself. Like playing the Browns. I mean the biggest problem is that Rye’s teacher is worried that she’s moving to slow and not keeping Rye challenged. I don’t really remember any of my teachers using that or a similar line with my parents so I’m guessing she gets that from Mom. So all in all our evening was sort of a microcosm of the ’76 Steelers. Started slow, finished strong. Either that or the Battle of Shiloh. Unrelated Top Three of Day: Top Three James Bond movies. 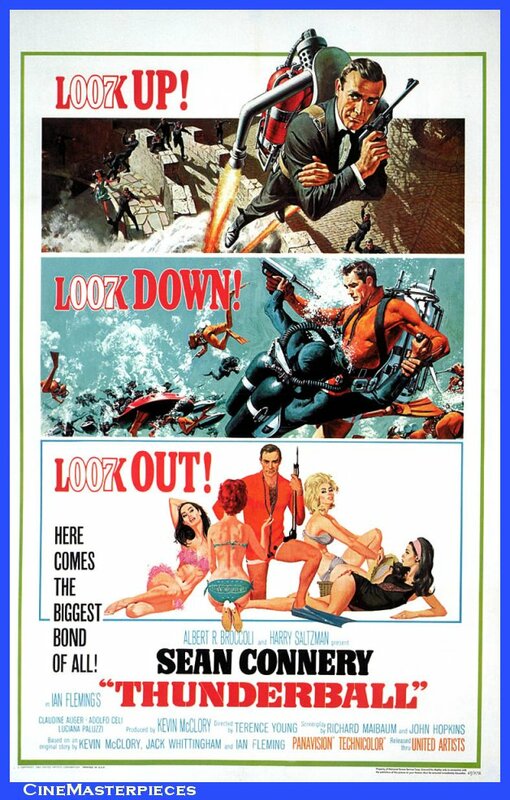 #1 – Thunderball. Underwater harpoon fight. Sharks in a pool. Awesome. 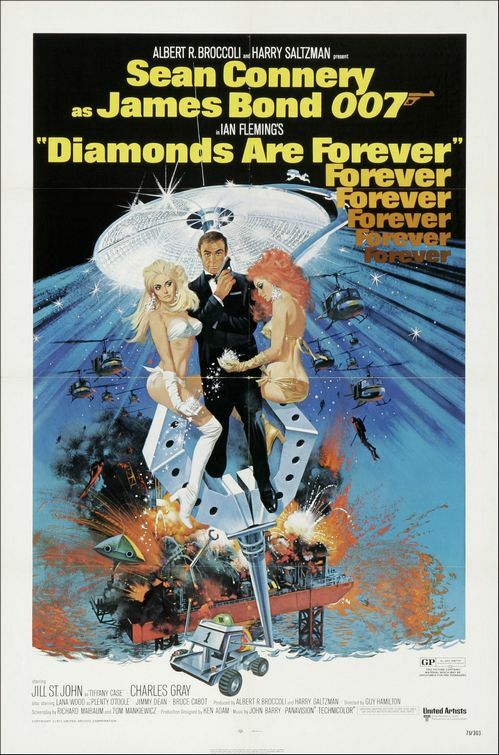 #2 – Diamonds are Forever. First one I remember watching when I was kid. Mr. Kidd and Mr. Wint are still weird. #3 – For Your Eyes Only. 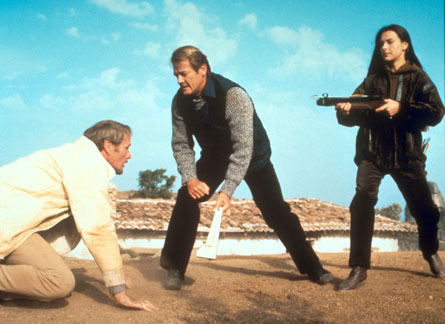 Best of the Roger Moore movies by far. Plus you got to learn what an ATAC machine was. The other day Mom and I are down in the basement working out. While we do this the girls have to take showers/baths and do their homework. If they don’t have some type of homework assigned, then they have to read. This keeps them from fighting and it forces them to develop some personal responsibility for getting things done on their own. Not that it has gone smoothly. The girls, Kinsey especially, have developed this habit of singing while showering. Which is only a big deal if you’re singing an entire CD’s worth of Hannah Montana songs. Our water bills were so high you’d think we were irrigating Death Valley. Furthermore, the girls have to engage in some cooperation to accomplish the bathing part of their responsibilities. In this, they do not excel. At first they all jumped in the shower together. But that was kind of like the Allies in World War II. Sure they were all on the same team but they didn’t really want to be and Stalin was completely unpredictable. Then we tried Rye and Bails together. Bails was still pretty small and we figured we needed an authoritarian presence in the actual shower to make sure she did some real showering. Lesson learned. If you put the oldest in charge of the youngest before the oldest is fully prepared for that kind of responsibility, it sometimes turns into The Lord of the Flies. So we switched to Rye going first and Kinz and Bails going together. This seemed counterintuitive at first. Rye’s the oldest and without her to direct things the other two might get distracted. Turns out Rye is in and out of there pretty fast when she’s not bossing anybody else around and blaming other for delays. And Kinz is pretty good at getting herself done and keeping Bails on track too. Kind of like the ’74 Steelers when Chuck Noll finally gave the reins to Terry Bradshaw and sat down Joe Gilliam for good. Surprisingly, the homework and reading part has gone generally well. Aside from the occasional border dispute about whether Kinz or Bails sticking their respective heads into Rye’s room constitutes them actually being in the room. Rye contends it does. Kinz and Bails disagree. We haven’t really discussed air space guidelines yet so it is, as of now, still unresolved. Anyway, Rye comes down into the basement the other day after we told them to get moving on the shower/homework routine. Mom and I are already a little irritated because all we’re hearing is what sounds like bowling or possibly gravity tests with heavy objects. None of which sounds like homework or reading. And she says this with the tone of a child who has worked hard on something. And the resulting pride from that hard work is something she desperately wants to share with us. And we just squashed it. Unrelated Top Three of the Day: Top Three Uniforms in Philadelphia Eagles History. #1 – Eagles 1974-1984. I’m biased toward 70’s uni’s anyway so this was an easy pick. #2 – Eagles 1996-present. The midnight green is cool. But since it departs from Eagles tradition there’s no way it can occupy the top spot. #3 – Eagles late 60’s-1973. Haven’t been able to track down when they started wearing these but they are sweet. Normally you go with shoulder stripes or stripes on the sleeves. Not the Eagles. Halloween isn’t what it used to be. And I don’t mean because it was cold, windy and rainy last week. On our street, at best, 30 percent of the houses were giving out candy. What. The. Hell? By the way, Riley went as an 80’s rocker chick. Side ponytail, hot pink earrings, faded jeans rolled at the bottom and a vintage ’86 Bon Jovi Slippery When Wet concert tee. Kinsey was Hannah Montana. Bailey was Sharpay from High School Musical. And Mom and I went as ourselves. In 1987. Mom had a cheerleader outfit and I had some shredded up Joe Elliot jeans and a high school football jersey. But none of that changes the fact that America has a Halloween crisis every bit as serious as Major League Baseball’s inability to promote any sort of parity. By the way, the World Series should not be played in November. It’s dumb. Not as dumb as the Falcons taking Aundray Bruce with the number one overall pick in 1988, but still pretty dumb. Anyhow, don’t get me wrong, the kids still get excited. But they have no frame of reference. Like Pedro Martinez when he said he was one of the most influential players ever in Yankee Stadium. They aren’t comparing trick or treating in 2009 to trick or treating in 1979 like I am, they just assume that most houses don’t pass out candy. Halloween isn’t freaking Arbor Day! You don’t get to choose whether or not to be part of it. It’s an American institution. I mean you don’t get to turn off your lights and ignore fireworks on the Fourth of July. Not passing out candy on Halloween is like booing Santa when he comes down the chimney. When did this happen? When did Americans decide this was okay? To find out I decided I needed to learn a little bit about Halloween in America. So I went to History.com. Turns out there was a show on The History Channel about it. Which surprises me considering how much time I spend on that channel. Of course The History Channel isn’t really about history anymore as much as it is about Ice Road Truckers. Turns out back in colonial American autumn festivals were pretty common. The founding fathers would get together with neighbors, tell ghost stories and talks all kinds of smack about King George. It was more common in the southern colonies than in the north. Kinda like NASCAR or wearing camo to church. Then, between 1845 and 1900, America was flooded with immigrants. Led by the Irish fleeing the potato famine of 1846. The Irish evidently already had some Halloween traditions regarding dressing up in costumes and going house to house asking for food or cash. Like congressional Democrats searching for a way to pay for their health care bill. Then sometime in the late 1800’s there was a steady change to how Halloween was celebrated. Americans evidently decided they wanted it to be more of a holiday that centered on community and neighborly get-togethers. Which of course is also the beginning of the tailgate party. Good people the Irish. Then the progressive do-gooders stepped in. They decided to take all the spookiness, scariness and pranks out of Halloween for the good of the children. Then the country elected Woodrow Wilson and enacted the first income tax. Which means that the progressive do-gooders not only tried to kill Halloween 100 years ago but they also tried to kill America. Sense a pattern? Anyway, up through the end of the 1940’s Halloween was more of a town autumn festival than anything else. But in some areas of the country trick or treating became the norm sometime between Calvin Coolidge and Ike. This is another reason why Calvin Coolidge is the greatest president in American history. He cut taxes and brought back trick or treating. Despite the misguided hopes of the progressive do-gooders they never really eradicated the spookiness, scariness and pranks involved with Halloween. Families in neighborhoods with lots of kids could, at least in theory, keep tricks from being played on them by handing out candy. Its nearly identical to the electoral strategy of the Democrats. Pass out some goodies so voters won’t engage in any payback. So, boom, the wonderful tradition of trick or treating in America was cemented into our culture. Today, according to history.com, Americans spend an estimated $6.9 billion annually on Halloween, making it the country’s second largest commercial holiday. So not only is Halloween fun, its good for capitalism. Other countries that celebrate Halloween? Ireland and the UK. Countries that don’t? France and Russia.